Vanek has a goal tonight and his stick has a pivotal assist. Defending net front is a definite issue for Capitals. Saw it again on that Vanek PPG. Dubinsky taking shift in Wennberg's place. #CBJ down two centers in third. #Caps down a D-man. It's only Game 1. Plus Josh Anderson who was ejected. #CBJ down 3 forwards. Foligno is one tough kid. Back on the ice now. DSP didn't score a goal in his last 29 regular season games. Had no points in his last 24. Talked to Smith-Pelly a little last week about being snake bit. He said he was hoping that he was just saving them for an important moment..
Carlson got his third assist of the night. Jakub Vrana got his first NHL playoff point with the primary assist. 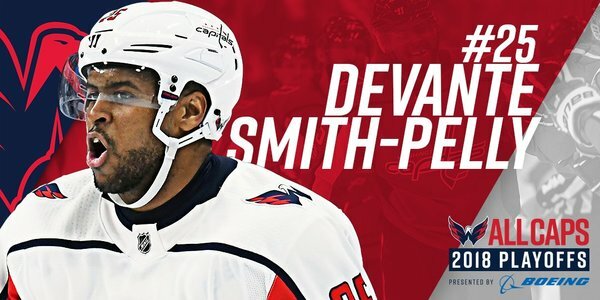 Devante Smith-Pelly's last playoff goal was with Montreal in Game 5 of the 2015 Eastern Conference Second Round vs. Tampa Bay. Kuznetsov gets 2 mins for slashing Panarin with 8:41 left. Blue Jackets PP (1-for-2 so far). Two shots for Blue Jackets on that PP. Burakovsky called for an offensive zone trip on Jones with 5:05 left. Jones almost accidentally dropped puck back into empty Columbus net during delayed penalty. And Jones ties it with 4:26 left. First career playoff goal for Seth Jones. Two power play goals for each team tonight. Blue Jackets season numbers on the PP aren't great, but they've been good on it in the second half and particularly since the trade deadline. Capitals and Blue Jackets headed to OT tied 3-3. First OT game if this year's playoffs. 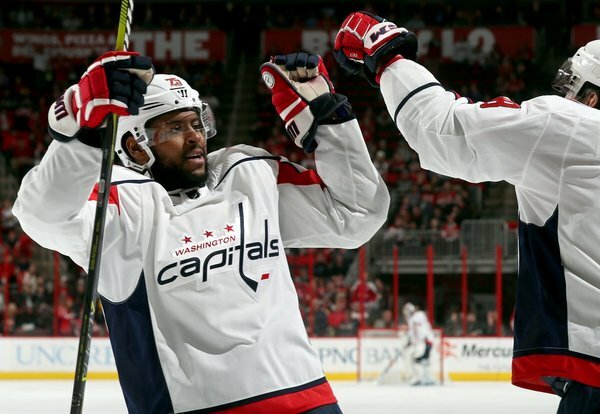 The Capitals went to OT in 5 of the 6 games in their first round series against the Maple Leafs last season. This one's headed to extra time. Obligatory booing from crowd when announcement is made that Metro will close at 11:30 p.m.
Caps-Blue Jackets overtime is underway.